As some might recall, part of Apple's move to iOS 6 included a new clock design. 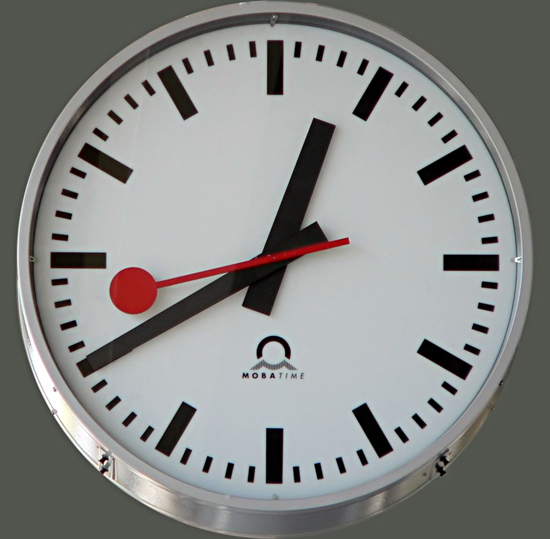 Unfortunately for them, this clock design was suspiciously similar to the one used by Swiss national rail company SBB. They knew it, and SBB knew it. Everyone that even so much as glanced at the two designs knew it. So, like usual, Apple settled with SBB for an undisclosed sum in order to license the design. How much is a clock design worth? Well, when you're licensing it after the fact, it looks like a clock design is worth around $21 million. As we've previously reported, Apple's iOS 6 update included a new clock design that was suspiciously similar to the one used by the Swiss national rail company SBB. So similar, in fact, that SBB was pretty upset that Apple went ahead and used it without contacting them. Proving that it actually is better to beg forgiveness than ask permission, SBB and Apple have now signed a licensing agreement for an undisclosed amount. Lovely. The conversations had about Apple's Maps app offered in iOS 6 tend to center around just how terrible it is. This is especially true in countries outside the United States, but really nowhere is safe from Apple's horrifying cartography. Taiwan, however, is having the exact opposite problem. 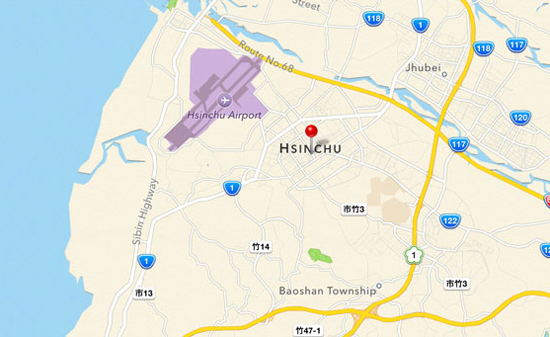 See, Apple Maps is a little too accurate when it comes to a top secret military radar base located in Hsinchu. Technically, this still falls under the "terrible" category. The internet loves to complain about Apple fans. There are plenty of reasons why people find Apple fanboys (and girls) annoying, but the central problem generally revolves around their tendency to explain away every problem with Apple's products with some sort of non-technical excuse, shrugging off the company's missteps as strokes of artistic genius. With that in mind, even true members of the cult of Mac have been at a loss recently looking for a reason why Apple's new Maps app, which even Apple admitted isn't the best service available, is actually amazing. Hot off the heels of Apple CEO Tim Cook's sheepish apology to consumers over their lackluster new Maps app, Apple has retracted one of its boldest statements about the highly-criticized service. Until yesterday, Apple's description of Maps on their website called it "the most beautiful, powerful mapping service ever." That sentence, which would now seem especially foolish in light of Mr. Cook's statement, has since been retracted and replaced. 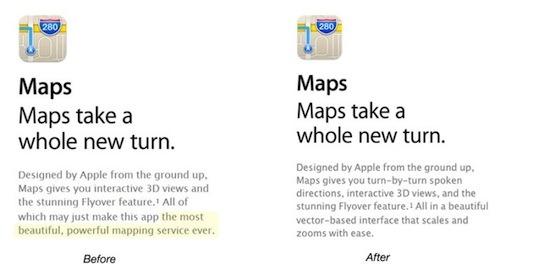 There's been a bit of an uproar over the iOS 6 update to Apple Maps. It's not even that they're completely unusable; it's the fact that some of it seems perfectly normal, and suddenly it's horrifyingly inaccurate. Sufficed to say, you wouldn't want to rely on them to get around. Even worse, Google apparently doesn't have any plans to bring an app of their own to the market. It's not good, but how bad is it exactly? Bad enough that Tim Cook, Apple's CEO, has officially apologized for it. There are problems with the iPhone 5 that are not involved with the ludicrously bad, phone-breaking revision to the map application. In addition to that completely baffling misstep, there are no docks yet that accommodate the iPhone 5 and its new Lightning connector. Unlike the lack of a map function that is elegantly and simply built into your phone, there is something you can do about this the lack of a dock! Casey Neistat shows you how to build an iPhone 5 dock out of just a couple of scraps of plywood. 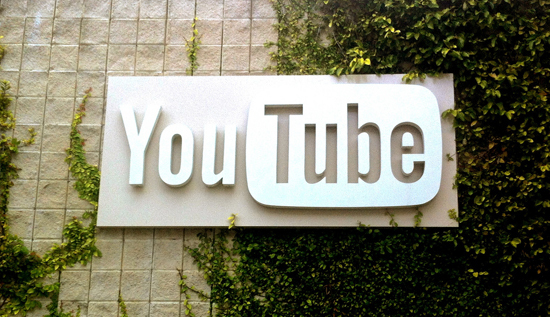 It is a very easy thing you can do if, like Neistat, you have quite the well-appointed workshop already. 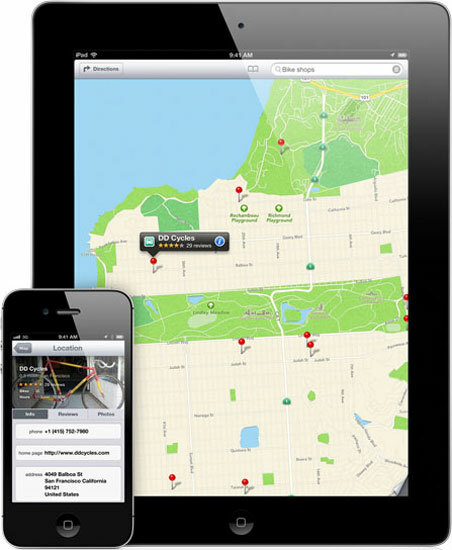 With the update to iOS 6, Apple finally rolled out their own mobile Maps app that would supposedly compete with what was previously offered by Google Maps. As most are well aware, the information that Apple managed to cobble together into one semi-cohesive lump has proven to be less than accurate. Some railway stations are designated as parks, parks as ponds, and ponds as unobstructed thoroughfares. In short, they border on dangerous. Google, while still maintaining something of a neutral stance, has now said that they have no app of their own on the way. The world of copyright and licensing is one full of convoluted oddities. Apple's no stranger to this habitat, as they've happily shown in the past, but it's unusual for the company to actually be on the defensive. They're almost always the aggressor in such cases, but their recent clock app design upgrade in iOS 6 may have landed them in the hot seat with Switzerland's national rail company. 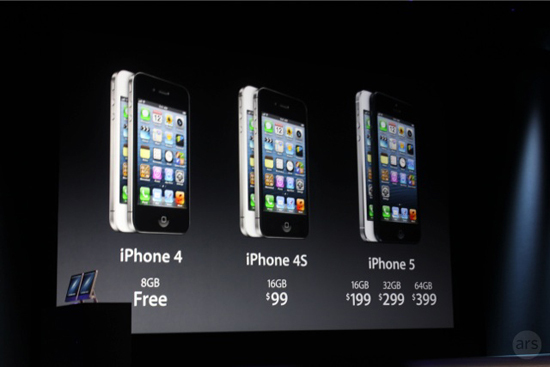 Well, folks, it's official: The latest mobile phone offering from Apple has been officially revealed as the iPhone 5. The phone features many of the features long rumored to be included, like a new version of the connector and iOS 6 already installed, and should come as no surprise to anyone that's been following the coverage closely. Even so, Apple fanatics will likely start lining up to preorder now though they won't be available until this Friday, September 14th. Apple's newest phone will then ship a week later on September 21st. The Path iOS app had brought attention to the fact that iOS apps can access user information even if they do not explicitly ask for permission. Apple seeks to remedy this -- when an app attempts to access your information, iOS 6 will notify you and ask for your permission. Hopefully, this will give users more control over their data, and make app developers more careful about how they handle user information. Apple May be Including Yelp Check-Ins in New Map App, Perhaps Snuggling Closer? 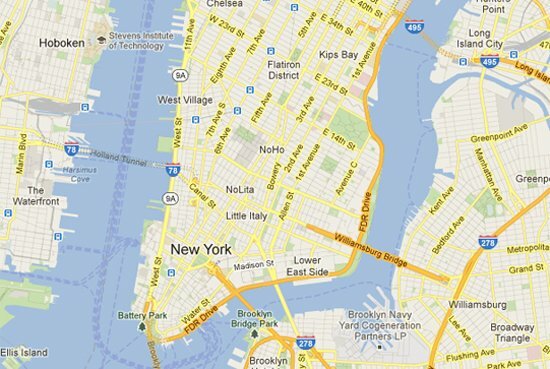 When Apple first unveiled the iPhone in 2007, one of its most immediately useful features was Google Maps integration. However, the partnership was short-lived as Apple has since moved to push Google out of bed, going so far as to roll its own map app debuting in iOS 6. Now, Apple may go a step further by baking Yelp check-ins right into the map app. Technology moves fast, so it should come as no surprise that with the introduction of a new version of iOS there's a new jailbreak that can crack it open. What might come as a surprise is that this new jailbreak surfaced less than 24 hours after the announcement of iOS 6; the operating system proper isn't even out yet. That said, the jailbreak isn't totally polished or even what you might call "usable", but it exists and it works. Tim Cook has wound up the Apple World Wide Developers Conference 2012 keynote and the Internet is collectively reeling from the blow. We've already taken a look at the new hardware Apple is rolling out, and now we turn our attention to the software. 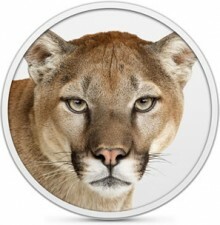 At the heart of the presentation is the forthcoming Mac operating system 10.8, or Mountain Lion to its friends, and iOS 6.